גודל התצוגה המקדימה הזאת: 515 × 600 פיקסלים. רזולוציות אחרות: 206 × 240 פיקסלים | 412 × 480 פיקסלים | 946 × 1,102 פיקסלים. MS in Hebrew and Aramaic on vellum, Iraq, first half of 11th c., 8 ff., 39x33 cm, 2 columns, (25x25 cm), 23 lines in a large Hebrew square book script, by a scribe perhaps originating from the Maghreb (North Africa probably Tunisia). Provenance: 1. 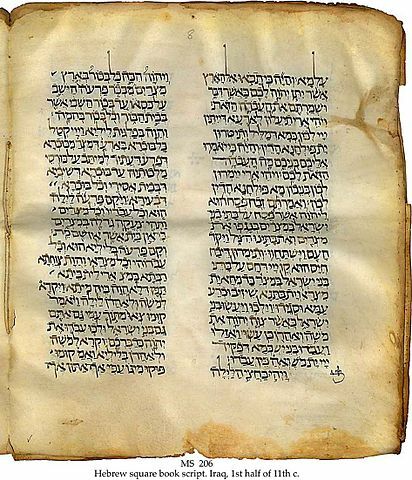 The Genizah of a Kurdistan Jewish community, North Iraq (until 1950/59); 2. Dr. Fischel, U.S.A.(from 1950/59 ; 3. Bernard Rosenthal, San Francisco. The text covers Exodus 12:25-31, beginning in Hebrew with the second word. The first word is the end of the Aramaic Targum of v.24; The Targum of v.31 is not complete, presumably continuing on the next page. עברית: תרגום התנ"ך לארמית מהמאה ה-11. בנוסח זה מופיע המקור העברי בצד התרגום: כל פסוק עברי מופיע כשאחריו תרגומו לארמית.